DC Comics is trying something new. In the wake of their Rebirth initiative, the publisher has rapidly expanded its content to include diverse new imprints such as Young Animal, Wildstorm, Jinxworld, Wonder Comics, Black Label, Ink, and Zoom. As their lineup expands, it can be hard to figure out what to pick up each week. That’s what our team is here to help with, every Wednesday, with the DC Round-Up! THIS WEEK: Two great stories– one the alpha and one the omega (for its first arc, anyways). Note: the reviews below contain spoilers. If you want a quick, spoiler-free buy/pass recommendation on the comics in question, check out the bottom of the article for our final verdict. After the incredible work that Cecil Castellucci did alongside Marley Zarcone and Kelly Fitzpatrick on Shade the Changing Girl, I was ready to follow Castellucci anywhere. The intergalactic fish out of water tale was unlike any other title DC has released in recent years. Shade taught me Castellucci could be insightful in bold new ways. 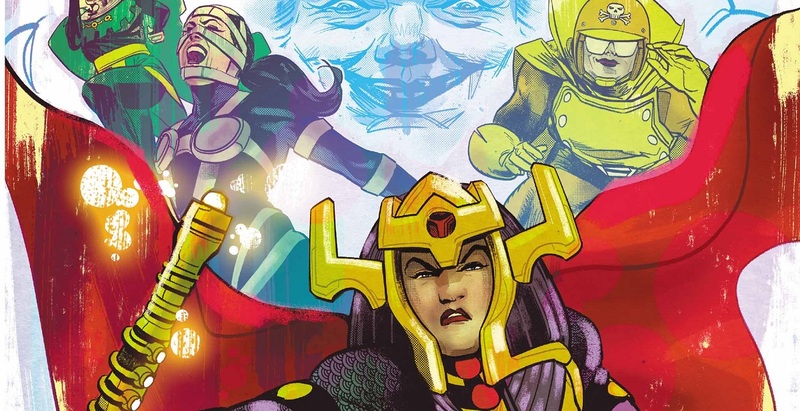 Her return to DC in the form of Female Furies #1 shows that she can be singularly incisive as well; this time alongside Adriana Melo and Hi-Fi. After Tom King and Mitch Gerads wrapped up their critically lauded take on Mister Miracle, Jack Kirby’s Fourth World seemed positioned for a renaissance at DC Comics. I didn’t think it’d look quite like this, though. One of the best elements of Mister Miracle was Big Barda– Scott Free’s partner and fellow escapee of Apokolips. In that book, she was Scott’s shield– a source of strength and indomitable will, even through the times where Scott Free’s own muster failed him. Female Furies, on the other hand, showcases a younger Barda who has not yet found that endless fountain of will. This is a Barda with much to learn. But she’s not the only one. While in the past, the New Gods of Apokolips, ruled over by the decidedly evil Darkseid, have generally been portrayed as explicitly cruel and selfish characters. The attributes we as readers would generally consider “good” are entirely foreign to them. And indeed, one would be hardpressed to call the Furies’ den mother, Granny Goodness– an honest-to-god kind soul. However, in Female Furies #1, the creative team accomplishes the unthinkable and transforms Goodness into a sympathetic figure. You see, while Goodness is certainly a cruel taskmaster to her orphan warriors, Female Furies #1 also casts her as a competent woman fighting for a seat at a table dominated by figures of the patriarchy. Throughout several flashbacks to Darkseid’s rise to power on Apokolips, we see her act as his right hand. She’s the one fighting right beside him as they go to take the throne from Darkseid’s mother. She’s the one who engages the matriarch in combat and ultimately lands the killing blow. But she also has credit for the kill stolen from her by Desaad, who gives Goodness a vial of poison to kill the queen with and then claims full honors for once Darkseid asks for a retelling of the murder. Later that night– shockingly– she’s even forced to give her body to Darkseid. He promises her power in exchange but then reneges, forcing her to do the “women’s work” of raising Apokolips’ orphans. And thus the moniker “Granny” is transformed from an alliterative vaguely evil sounding name into an Apokolips slur that buries Goodness’s physical competence beneath the role she is expected to perform by the men around her. Years later, the patriarchy is a poison that not only oppresses Goodness, but her all-female squad of soldiers as well. In her own words, Goodness says the Furies have “never failed a mission.” They’re some of the strongest– if not flat out the strongest– warriors on the planet. And yet all of them, from Barda to Stompa to their leader, Aurelie, find themselves judged not for their competence in combat, but rather for their inability to bake or wear evening gowns up to Darkseid’s standards. It’s a heinous implementation of archaic social roles that not only tears down the furies, but tears them apart as well after Aurelie is selected for a special private training session that Barda and the others interpret jealously, but which we the reader quickly discover is nothing but a guise for another man to sexually harass a woman seeking to be judged for her merits rather than her looks. And of course, at the end of Female Furies #1, the status quo is upended. A murder is committed and things will have to change for the Furies because of it. Through both absurd comedy and appalling scenes of men in power misbehaving, this creative team showcases the myriad of ways in which the patriarchy has failed. The question now is– what comes after it is dead? The Dreaming is great storytelling. Everyone likes to talk about the first issue of a comic. I’m guilty of it too. There’s something very exacting about building an opening to a world that pulls the reader in, gives them something to latch on to, and leaves them wanting more– all in the space of 20-32 pages. But while a great first issue is exhilarating, there’s nothing as satisfying as a book that sticks the landing on the last issue of an arc. Over the last six issues, The Dreaming has been setting up dominoes all over its expansive world. In Dora, we have a strange and mysterious fish out of water who doesn’t quite belong to the Dreaming, but doesn’t necessarily belong anywhere else, either. In characters such as Lucien, Merv, Cain, and Abel, we have classic characters from The Sandman who have seen their former roles in the Dreaming dramatically change, And in the Judge, we have our antagonist– the force that resists the future in favor of a memory when things were stable. But in all these characters, we see ourselves, both at our worst and our best. We’ve all been the outsider. We’ve all felt unmoored. And we’ve all felt uncomfortable with one change or another. But for the most part, we can compartmentalize. One side of us feels more activated than the others at any given point of the day. What’s fascinating about The Dreaming then is that it imagines us in microcosm, when all those different elements– wants, fears, desires– come crashing together in a destructive storm. I love the way that Dora has evolved throughout this arc. She started it as a loner and something of a hedonist, traveling between dreams for fun and food despite the rules of the Dreaming prohibiting it. She felt purposeless and betrayed by Dream, who adopted her when she was at her lowest and then seemingly left her to rot in his domain with nothing but a new small broken trinket at her doorstep each day to keep her entertained. Then, she went from being lonely to being persecuted by the Judge as he attempted to cleanse the Dreaming of its new elements in the hopes of making it great again. And then she discovered that maybe those gifts were keys– a way for her to recover the memories she lost before Dream found her. What all these turns in Dora’s character have in common is that they have been pulling her along by a thread. Where characters like the Judge have been actively imposing their will upon the Dreaming, she has been passive. Indeed, she was cowed by a dream suggesting that she was not real. Everyone in the Dreaming is broken. Dream is gone and no one knows what their role in the world is anymore. But they were lucky– they were born in a world where at one point, denizens were created being told what their purpose was. But now, at last, they, like Dora, are learning that only they can define what their role in the world is. Only they can decide whether or not they belong. Their stories, like our lives, are as full, as real, as wonderful and affecting, as we want them to be. Literally zero mention of the art in either book. On a website devoted to comics, a predominantly visual medium. Amazing. For info, the art on Female Furies is not good. It actively detracts from the quality of the writing, which is excellent. For The Dreaming, it’s quite the opposite, the quality of Evely’s work carries the writing. She is absolutely the star of the show.